Our Literacy Coordinators and Enrichment Coordinator ran two workshops this week for parents. The first was on how to support your child learning to read and the second was on how to continue developing and extending reading skills. The emphasis was on the importance of developing a love of reading and literature, because without this the purpose of learning to read is lost and it becomes a laborious task and a chore. The skills of learning to read need to have longevity if the act of reading is to become part of your life as a tool for learning, enjoyment or relaxation. 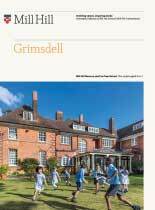 At Grimsdell we believe in children accessing high quality literature of differing levels in order to read for meaning and pleasure, as well as being able to decode. 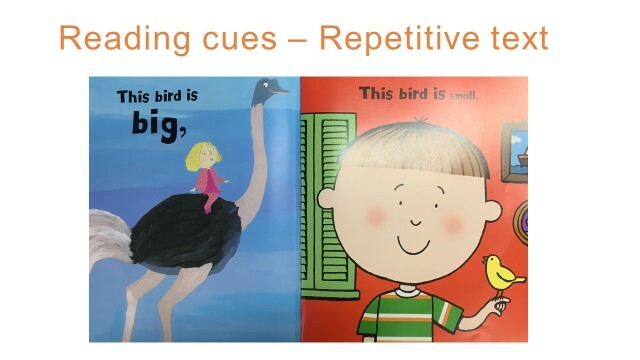 Our rigorous teaching of phonics (hearing, verbalising and recognising the letters and sounds in words) underpins our approach and the children then have the skills to apply their phonological understanding to words in books. 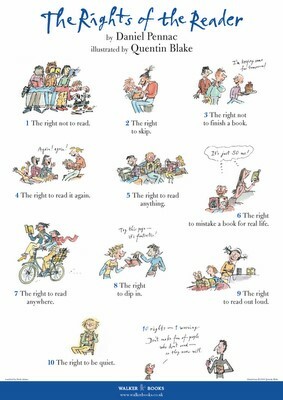 Books are chosen for their content, meaning, vocabulary and ability to spark imagination. They offer huge variety and offer children of all abilities the opportunity to read for pleasure, for ease, for fun and for a challenge. Our library works in tandem with our approach to reading in class and at home – and children are surrounded by opportunities to access and enjoy books. Our approach has removed competition in reading as there are no levels. We also breaks down barriers to learning to read, as every child is deemed a ‘reader’ and has the opportunity to access challenging books that provide sophisticated content and vocabulary or words. We encourage reading of any material rather than viewing reading within the confines of a reading scheme book. One parents summed it up by saying that her daughter is now choosing to read her books at home and didn’t realise that she could actually pick these up and read them before. Reading scheme books tend to steal the status of ‘reading’ from other books and we want to open up children’s minds to reading anything, anywhere, anytime. Another parent shared with me that her daughter has now developed such a love of reading because she ‘owns’ her books by being empowered to choose them – and they find her hiding under her duvet reading a book when she should be asleep! 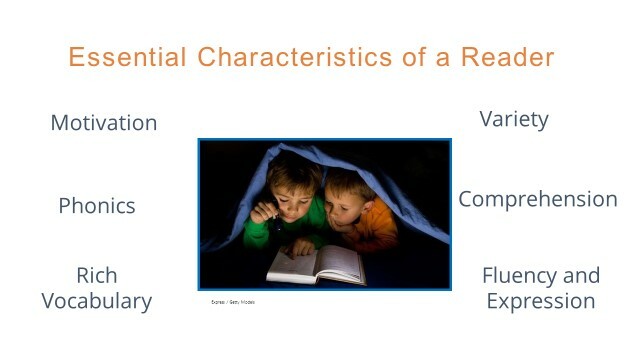 Here are one or two examples of slides within the Early Readers presentation which may be useful and interesting for any parent reading my blog this week. In this book the text is repeated on each page, with only the final word changing. This helps the children to begin to learn to recognise and read high frequency words and the repetitive style makes reading more fluent. The pictures enable children to work out unfamiliar words. It’s ok if they make a guess, just encourage them to use the initial sound and picture to work out what it says. The pictures are an essential tool in helping children work out what the words say, so don’t be tempted to cover them up! 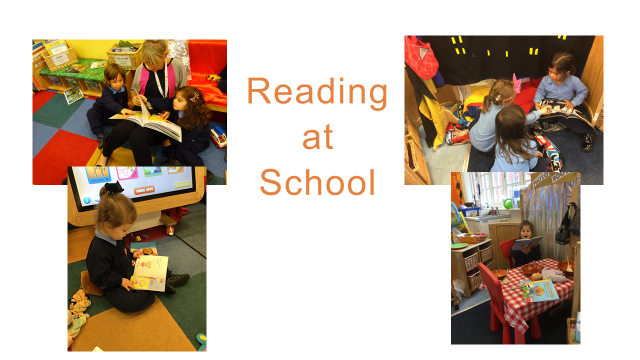 Here you can see children engaged in a variety of reading experiences at school. Grimsdell pupils have access to a wide range of books in their classrooms as well as the school library. In a guided reading session, the children read with the teacher in a small group. 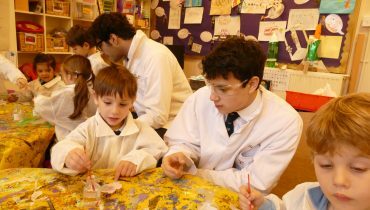 Children engage in discussions about the book, looking at the front cover illustration and title to gain an idea of what the book might be about. 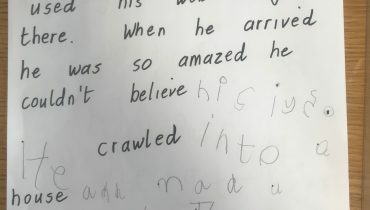 The teacher will then guide them through the book, using the pictures to develop ideas about what is happening in the story, supporting children in sounding out and blending unfamiliar words or spotting tricky words, talking about punctuation and predicting what might happen next. There is always a specified learning intention for the group, but teachers and TLAs are also able to use their knowledge about the children in the group to support and question them individually, for example supporting one child in applying their phonic skills or encouraging another child to talk about how a character might be feeling at a certain point in the story. 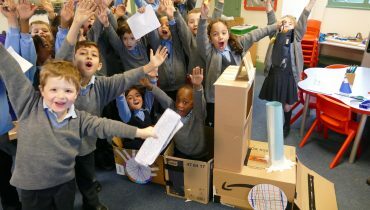 Once children have been supported through reading the book in this way, they then have an opportunity to read the book independently, which is incredibly empowering for them and really starts to build their confidence as a reader.